Provisioning and catering for a wide range of tastes and a sophisticated clientele is a minor miracle performed by many superyacht chefs. Whatever your yacht size, and however its used, the biggest challenge can be budgeting and provisioning efficiently. 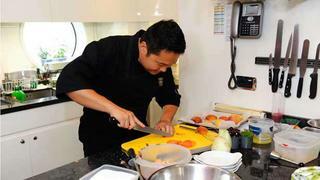 We spoke to a head chefs who are crew on private and charter vessels, on how they cater for owners, charterers and crew, with a sometimes limited budget. The quantity of food needed each week is huge. You cant just go to the local market and pop a tonne of fruit and vegetables and dairy products in the back of the crew car each week. It is necessary to source everything from a provisioner, who can make sure you get everything that you need, when you need it and wherever you are. This comes at a price but is most certainly required. Theres an issue of keeping 70 people from over 20 nations happy every day. To tackle this, meal times require a larger quantity of food. You need two to three main courses, soups, selections of side dishes, salads and desserts, all served as a buffet. There has to be enough to make sure everyone can have some, so there are always leftovers. We wont shamelessly throw everything away, not just because of the cost, but because it is a waste. Serving back food to the crew is a delicate situation  if it looks like yesterdays food they wont touch it. But if you prepare something nice, more crew will thank you than did the day before. A lamb stew can be strained and made into Cornish pasties; seafood risotto can be made into arancini balls, fried and served with a spicy tomato sauce. We use what we can a second time  anything left after that is wastage. A private yacht sees a lot fewer guests in a year than a busy charter yacht, so the regular re-stocking of guest provisions, and the option of using and eating the remaining guest provisions isnt there as a regular backup. The crew of a private yacht also has a lot more time on its hands and tends to spend more time eating snacks. The need for a relatively greater budget on a larger private yacht than on a smaller busy charter yacht is apparent, and both are manageable in their own environments. Get involved or use a management company? From low- to high-end, overall budgets can range from $33,000 a year up to 460,000 a year. How much the owner of a yacht is involved with such figures varies massively. Management companies are there to advise and control these things. Any yacht owner will be aware of the staggering difference in the cost of running small to large yachts and how much difference chartering their yacht can make, compared to keeping it solely for personal use.